As part of our 100 Acts of Kindness Challenge we've been doing all sorts of big and little things to spread kindness. Many of our acts of kindness have been around the house, like our Bingo kindness game, and some have also focused on places nearby, like our litter scavenger hunt. One of my favorite ways to spread kindness is by getting my kids together with their friends and finding ways to make a difference. Last week we made simple kindness jars at our Kindness Love Fest. 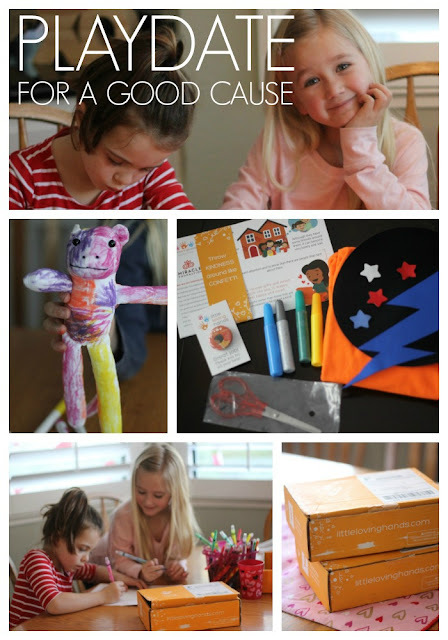 This week Little Loving Hands sent us two craft kits so that we could have a playdate and do a craft for a good cause. 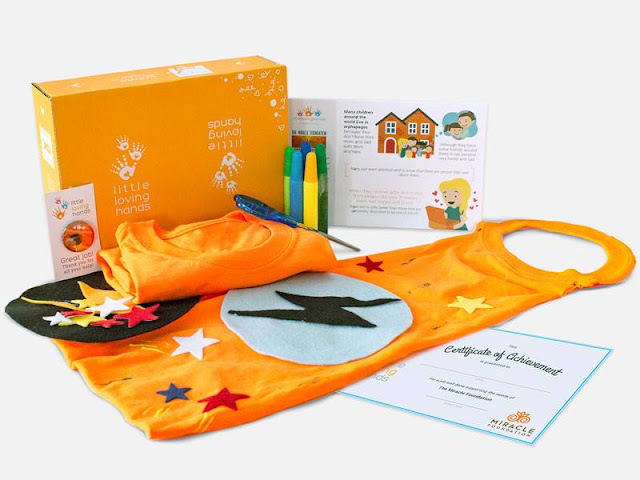 Little Loving Hands provides parents and educators with a fun way to educate their children on the importance of caring and giving back through monthly craft boxes. For our special playdate, we made a treat and then pulled out our boxes and got to work! Little Loving Hands craft kits can be used all year long!! I've shared my top tips for successful playdates before. One of my favorite things to do is provide a few structured activities along with a lot of free play time! For our Little Loving Hands playdate, the girls had free play for 45 minutes and then I invited them downstairs to open our craft boxes. While things were drying, they took breaks to go do free play as well. When we got started we opened a Sock monkey craft kit and a Super Hero box. They were both adorable and the girls immediately couldn't decide who would do which kit, so we decided to work together on both! Each kit comes with all of the supplies you'll need to do the craft and mail it off. I didn't have to go roaming through my drawers to find materials, though we embellished a little bit with our crayons. The t-shirt super hero cape is one activity I am totally going to do again. The girls designed their capes on the paper template and then spent forever decorating the t-shirt cape with glitter glue and paint. They both also thought it was so cool to use the iron (with adult help) to iron on their super hero cape embellishments. Our Sock Monkey puppet craft was SO EASY and didn't require very much guidance from me... which is always awesome when crafting with friends, while also watching all of my other kids. The girls designed their sock monkeys on a scrap paper and then worked together to decide how they were going to color the fabric stuffed animal monkey with fabric markers. I loved watching how they negotiated in kind ways! At the end of our playdate the girls each received a certificate of achievement and a special button from the organization that they helped! 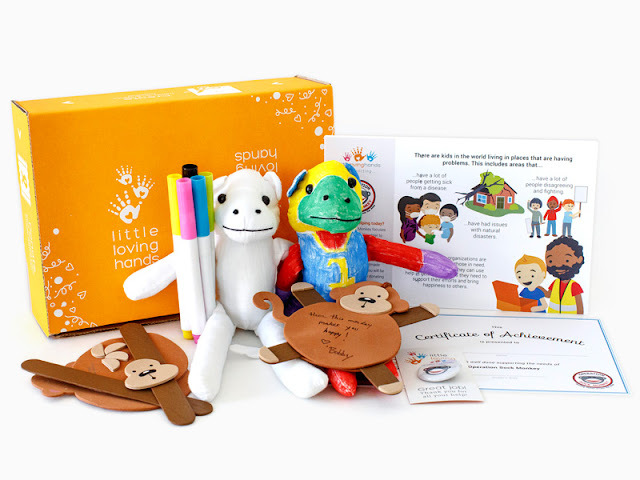 To get more information on these cool kits, head on over and check out Little Loving Hands on Facebook, Instagram, Twitter, and Pinterest. You can also follow along for more craft ideas, inspirational messages, and service ideas. 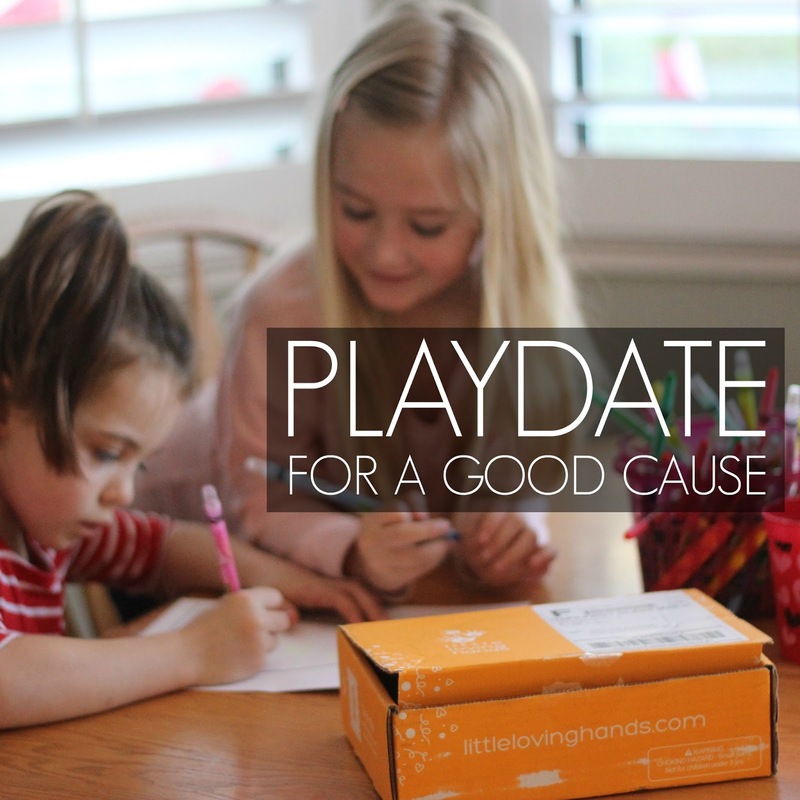 Have you ever done structured activities at a playdate? Have you tried doing any acts of kindness at your playdates? Although I love coming up with my own crafty ideas, with four kids plus extra friends, sometimes it is fun to let someone else do the creative work and just open a box and have everything there and ready to do when you need it! 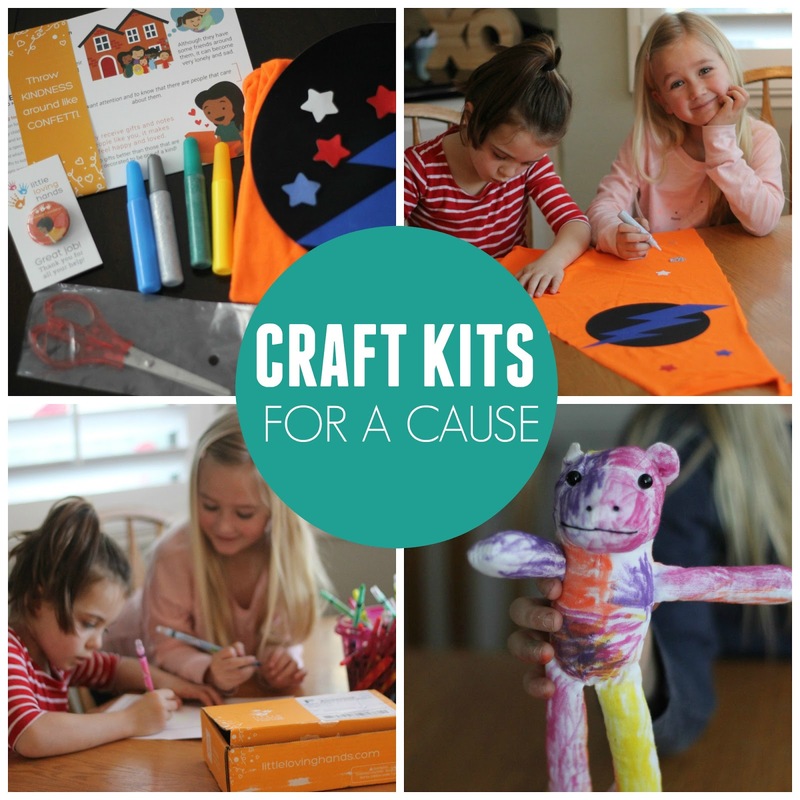 If you haven't tried Little Loving Hands craft kits yet, go and do it! I love them! Come join us over in our 100 Acts of Kindness Facebook Group for more kindness activity ideas as we wrap up our kindness challenge over the next week. Help us spread kindness like confetti! No act is too small! Disclosure: I received two free craft boxes from Little Loving Hands for this post. All opinions are my own!